In week from now this nation will celebrate the 70th anniversary of her independence from the British, with pomp and pageant. Military parades, religious ceremonies, cultural festivities, stirring speeches and other self-congratulatory events will be held. To be sure, part of this anarchic situation is due to the ongoing local government election campaign and the jockeying by different parties to obtain maximum political benefit for themselves, further exacerbated by the uneasy alliance of the two main political rivals in the grand coalition. But herein lies one of the fatal weaknesses of our shortsightedness where important national interests are made subordinate to short-term political advantages. Two recent events have sparked my decision to write this letter. The first, the utterly shameful and revolting conduct of our legislators, including senior members of both the government and the opposition (those who due to their seniority, their long experience and their backgrounds should have known to exercise restraint), during the emergency session of Parliament to debate the report by the Commission of Inquiry into the Issuance of Treasury Bonds on January 10. The second matter I wish to talk about relates to the visible lack of authority, coherence and unity in the government. The majority of people in this country appreciate and value the democratic freedoms and the space that has been opened up since 2015 and understand the reluctance of the administration to resort to heavy handedness. People are also aware of the strains and tensions of running a government in these circumstances. A government however is elected to govern, and not to present a picture of indecision, constant bickering and paralysis to the nation.This lack of consistency and the pulling in different directions by the leadership of the nation breeds uncertainty, and impacts harmfully on state administration as well as on overall national confidence. Finally, I want to touch on the huge menace of narcotics and substance abuse in this country. In my visits to our parishes in many areas of the country, it is very, very common to hear about the easy availability of various types of drugs and of their use by many young people in our country. Not only are their lives being ruined by their addiction, but there is also damage to their families and to communities as well as to society at large due to resultant criminal activity. Recently we saw and read about a vast quantity of seized narcotics being publicly destroyed in the presence of the President and the Prime Minister. We also frequently read about small-time smugglers or dealers who been detected, arrested and fined or imprisoned. But rarely do we hear about the arrest or prosecution of major figures behind the import of narcotics into the country. I wonder why this is so? During the last election campaign, we heard much about drug dealers and politicians who were backing them and about how action would be taken against such persons. Surely it is not the small-time smuggler or the dealer who is behind the huge networks that finance and supply narcotics to the market and who while enriching themselves massively and illegally also callously bring ruin and destruction to the youth of our nation? I call on our leaders and the government to take serious stock of the situation of the nation as we approach the beginning of the seventh decade of our independence, to put aside their arrogant, selfish and foolish behavior, to remember the promises they made to the people three years ago for an honest corruption-free administration dedicated to putting the interest of the people of this county, especially the weak, the powerless and the voiceless foremost, to be true and faithful to the teachings of their own religions. Very Well said Your Lordship but will fall on deaf ears. SL politicians of all colours are more interested in themselves rather than the people. What use of all pomp & pageantry if people don't have real independance & freedom. Aimless drift and chaotic and open contradictions may be visible due to the multiparty govt. with diverse and contradictory principles to collect votes. But as the Bishop says, if it is focused on the nation where the govt. and the governed all have equal rights determined by the legislature, there can only be righteousness and justice, whatever the party political hue is. There is ONLY ONE TRUTH. Unknown to most, under the leadership of all denominational heads, the church fast and prayer for the nation for 21 days, ended in January. The atmosphere changed and all met again for thanksgiving to God on 4th February evening and the church needs to continue with it.The President gave an excellent speech on Independence day in the midst of a wide display of rituals. Behavior of legislators who are elected to govern sure need orderly action. Lack of authority, coherence and unity makes us all behave like an unpredictable circus, unless we be reconciled to God and to one another, but above all have unity in our individual spirit, soul and body alignment without schizophrenia. Then alone can our freedom of "Independence from nations" become our "Dependence on God" and oneness in spirit with him, agreeing to act in the one truth of righteousness and justice without ad hoc selfish decisions. Narcotics and drugs need a govt. ministry to help with eradication and punishment of offenders to mitigate the menace. It also needs the ministry of deliverance if rehabilitation is to be effective and so the church has a major role to play which fearless action cannot be done by any other. Thank you Bishop that with the leadership of the entire believer group, you first called on God with fasting and prayer to shift the delaying and restrictive atmosphere of righteousness and justice over this nation into a wholesome peace exposing dark spiritual powers obstructing kingdom govt. Restoration into the original intention for us must continue as truth alone will win, not idols. Bishop, the leadership you gave to the prayer movement has caused a spiritual shift in our atmosphere and many hidden agendas of darkness are getting exposed, to be dealt with. Meetings like that of February 4th need to occur monthly after distribution of prayer points downloaded to the leaders, so that true governmental rule will be established on earth. This nation will arise and shine. 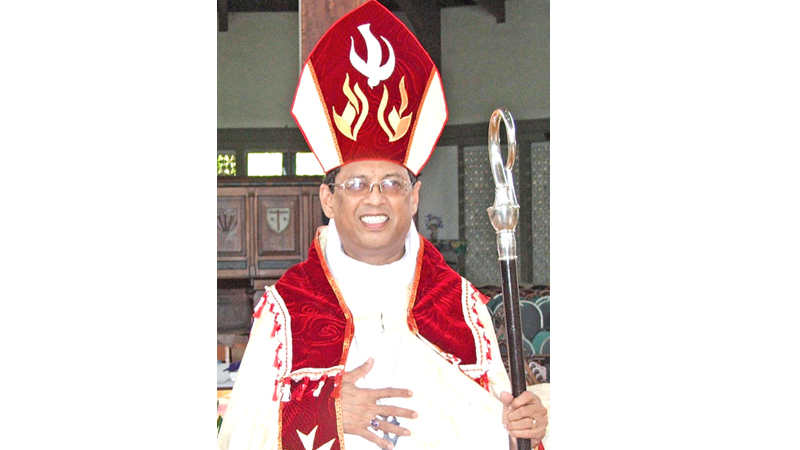 As the Archbishop is responsible to act on behalf of Catholic Christians, Bishop Dhiloraj gave leadership to the other Christian denominations gathering them in the prayer movement which must continue with added momentum to clear the wicked spiritual atmosphere over our nation, so that all corruption is exposed karmically and eliminated. Then only can we all live together in peace and harmony, and be reconciled to one another, every human being loved by God in sacrificial mercy. It is commendable that the Anglican Arch Bishop as always has come out to support the truth.It is shameful that the Catholic Cardinal has not done the same.He had set a precedence by fraternising with the politicians especially one regime.The most important question is that of Law and Order and the need to enforce it in a just and independent manner.To guarantee the rights of every citizen irrespective of Religion , Ethnicity and social status is vital above any other considerations.The Religious leaders should exercise control in disciplining their clergy and priest and strictly enforce the rules within the organisation.It is important that the Government functions independently of Religion although it can take advice. A concerned Catholic.